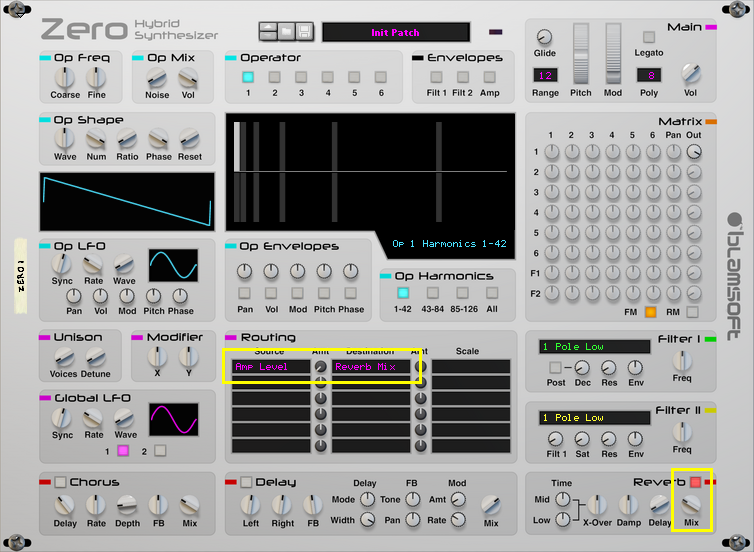 In this brief tutorial, we’ll look at how to use Zero’s mod matrix to create ducking effects. Ducking effects create a dry sound while notes are held and then allow the effect to be heard as the amp envelope decays. It gives a cleaner, clearer sound to some patches. You may have previously seen the ducking delay effect in Propellerhead’s The Echo device. Ducking reverb is a popular effect as well. It’s pretty straightforward since Zero was designed with the right mod sources and destinations for this feature. You can follow the steps for a very simple patch and then know how to apply them to your own patches. First we’ll create a ducking delay. Start by creating a Zero synth. Right click on it and choose Reset Device to load the default settings. First change Operator 1’s waveform to a sawtooth, at 5.0, so it will be easier to hear the effect. Enable the delay by clicking the button in the top left corner of the delay section. Turn up the delay mix to about 7. It is very obvious that the delay echoes mix over the top of the original sound. Now we’ll set up the ducking. In mod row 1 choose Amp Level as the source. Amp Level is the level of the loudest note being played. Now for the destination choose Delay Mix. It’s near the bottom of the list. Turn the amount knob all the way to the left. This means that delay mix will be brought down to dry when the amp level is high. That completes the ducking delay. You can check your settings in the image below. A ducking reverb is very similar. Disable the delay effect for now and enable reverb instead. Now just change the mod destination from Delay Mix to Reverb Mix. That’s all there is too it. With these settings the effect is very exaggerated. You can decrease the negative amount in the mod matrix and adjust the effect dry/wet to taste. Here is an image with the settings highlighted. That’s it. Have fun tweaking your effects!